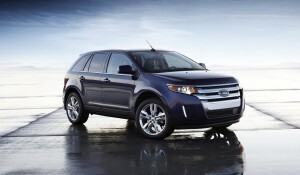 The 2011 Ford Edge definitely has an “edge” with its bolder, more smoothly flowing exterior character lines, stronger grille presence and new chin spoiler. The hood flows into the A-pillar, displaying the essence of sculpture. The exterior enhancements are matched by the interior modifications that reflect heightened craftsmanship, the utilization of better materials and improved fit and finish. Touch points have been softened and flexibility improved in terms of space for gear stowage. 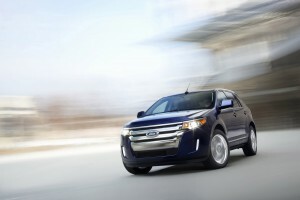 Starting at $27,515, the 2011 Edge is available in four models: SE, SEL, Limited, and a Sport trim with a more athletic presence and added power. New features for 2011 are: MyFord Touch; the all-new 3.5-liter Ti-VCT V6 engine; 18-inch wheels and tires on Edge SEL and Edge Limited; retuned suspension; available HID headlamps; thicker acoustic-laminated windshield and enhanced sound package. In addition to the upgraded high-tech exterior appearance, the 2011 Edge gains more power for the SEL and Limited models provided by the 3.5-liter 24-valve Ti-VCT V6 that produces 285 horsepower and 253 lb.-ft. of torque. Power for the top-of-the-line Edge Sport model comes from a 3.7-liter V6 that generates 305 horses and 280 lb.-ft. of torque — the same engine in the 2011 Mustang. Both engines mate to a six-speed SelectShift automatic transmission, with the Sport model providing class-exclusive paddle shifters that activate gear changes without having to shift to a manual mode. My test 2011 Ford Edge was a front-wheel drive model in Limited trim finished outside in a Red Candy tinted metallic hue and done inside in Black leather with satin-finished faux wood trim accent pieces. The base price was $34,220, while extras such as the metallic paint, Vision Package, Driver’s Entry Package, Voice activated Navigation system and destination charges raised the price to $37,475. The 2011 Ford Edge is an attractive crossover utility vehicle that clearly displays Ford’s Blue Oval DNA in an advanced and futuristic way. In addition to its improved good looks, the performance is gratifying with the 3.5-liter V6 delivering all the power that’s needed to the front wheels via the 6-speed automatic transmission, that makes for smooth gear transitions. The ride quality is compliant and comfortable without being mushy. Handling characteristics are positive with an on center feel from the steering. The 60/40 split folding rear seat adds to the Edge’s versatility and functionality, making it possible to convert the interior to suit cargo and passenger needs. MyFord Touch is a driver-connect technology powered by SYNC that links drivers with in-car technologies and their digital lifestyles. MyFord Touch replaces most traditional vehicle buttons, knobs and gauges with clear, crisp LCD screens and five-way controls like those found on cellphones and MP3 players. It also utilizes voice commands and is standard on Limited and Sport models. TURNING CIRCLE (curb-to-curb) 39.3 ft. This entry was posted in Get Off the Road, Rely on the Auto Experts -- Motor Matters Reviews. Bookmark the permalink.